Colusa County is a county in the U.S. state of California. As of the 2010 census, the population was 21,419. The county seat is Colusa. It is in the Central Valley of California, northwest of the state capital, Sacramento. Colusa County is one of the original counties of California, created in 1850 at the time of statehood. Parts of the county's territory were given to Tehama County in 1856 and to Glenn County in 1891. The county was named after the 1844 Rancho Colus Mexican land grant to John Bidwell. The name of the county in the original state legislative act of 1850 was spelled Colusi, and often in newspapers was spelled Coluse. The word is derived from the name of a Patwin village known as Ko'-roo or Korusi located on the west side of the Sacramento River on the site of the present-day city of Colusa. The name was established as Colusa by 1855. Present-day Colusa County was originally home to the Patwin band of the Wintun people, whose territory included areas along the Sacramento River as well as lands extending west towards Lake County, bounded in the north by the sources of Stony Creek near Stonyford and in the south by Putah Creek. Present-day Colusa County was included as part of three Mexican land grants: John Bidwell's smaller 1845 Rancho Colus grant, which included the modern city of Colusa; the larger 1844 Rancho Jimeno grant, which surrounded the Colus grant; and the 1844 Larkin's Children grant, located upriver from Colusa near the present town of Princeton, California. According to the U.S. Census Bureau, the county has a total area of 1,156 square miles (2,990 km2), of which 1,151 square miles (2,980 km2) is land and 5.6 square miles (15 km2) (0.5%) is water. A large number of streams drain the county, including Elk Creek, Salt Creek, Stony Creek and Bear Creek. The county's eastern boundary is formed, in part, by the Sacramento River. The 2010 United States Census reported that Colusa County had a population of 21,419. The racial makeup of Colusa County was 13,854 (64.7%) White, 195 (0.9%) African American, 419 (2.0%) Native American, 281 (1.3%) Asian, 68 (0.3%) Pacific Islander, 5,838 (27.3%) from other races, and 764 (3.6%) from two or more races. Hispanic or Latino of any race were 11,804 persons (55.1%). As of the census of 2000, there were 18,804 people, 6,097 households, and 4,578 families residing in the county. The population density was 16 people per square mile (6/km²). There were 6,774 housing units at an average density of 6 per square mile (2/km²). The racial makeup of the county was 64.3% White, 0.6% Black or African American, 2.3% Native American, 1.2% Asian, 0.4% Pacific Islander, 26.7% from other races, and 4.5% from two or more races. 46.5% of the population were Hispanic or Latino of any race. 8.5% were of German, 5.6% English, 5.5% American and 5.4% Irish ancestry according to Census 2000. 58.7% spoke English and 40.4% Spanish as their first language. There were 6,097 households out of which 41.4% had children under the age of 18 living with them, 59.6% were married couples living together, 9.6% had a female householder with no husband present, and 24.9% were non-families. 21.5% of all households were made up of individuals and 10.1% had someone living alone who was 65 years of age or older. The average household size was 3.01 and the average family size was 3.51. The median income for a household in the county was $35,062, and the median income for a family was $40,138. Males had a median income of $32,210 versus $21,521 for females. The per capita income for the county was $14,730. About 13.0% of families and 16.1% of the population were below the poverty line, including 19.5% of those under age 18 and 8.2% of those age 65 or over. 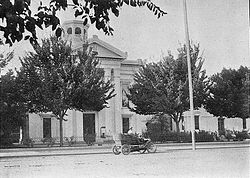 In its early history Colusa was one of the most reliable Democratic counties in California. Along with Mariposa County, it was one of only two counties in the Pacific States to support Alton B. Parker in 1904. From 1892 until 1952, Colusa only went Republican during the GOP landslides of the Roaring Twenties. Since 1952, however, Colusa has become a strongly Republican county in Presidential and congressional elections, with Lyndon Johnson, in 1964, being the last Democrat to win the county. Colusa County is in California's 3rd congressional district, represented by Democrat John Garamendi. In the State Assembly, Colusa County is split between the 3rd and 4th districts, represented by Republican James Gallagher and Democrat Cecilia Aguiar-Curry, respectively. In the State Senate, the county is in the 4th Senate District, represented by Republican Jim Nielsen. Colusa County Airport is a general-aviation airport located near the city of Colusa. The population ranking of the following table is based on the 2010 census of Colusa County. ^ "Snow Mountain". Peakbagger.com. Retrieved May 13, 2015. ^ a b "The Creation of Our 58 Counties". California State Association of Counties. Retrieved 2019-03-03. ^ The Statutes of California Passed at the First Session of the Legislature (PDF). San Jose: J. Winchester, State Printer. 1850. p. 62. ^ "How Did Our 58 Counties Get Their Names?". California State Association of Counties. Retrieved 2019-03-03. ^ Gannett, Henry (1905). The Origin of Certain Place Names in the United States. Washington, D.C.: Government Printing Office. p. 88. ^ Heizer, Robert; Hester, Thomas (1970). "Names and Locations of Some Ethnographic Patwin and Maidu Indian Villages" (PDF). Contributions of the University of California Archaeological Research Facility. 9: 84. ^ a b Hoffman, Ogden (1862). Reports of Land Cases Determined in the United States District Court for the Northern District of California. San Francisco: Numa Hubert. pp. 37, 41. ^ Plat of the Colus Rancho. San Francisco: U.S. Surveyor General's Office. 1860. ^ Grants of Land in California Made by Spanish or Mexican Authorities (PDF). Sacramento: California State Lands Commission. 1982. pp. 25–26. ^ "U.S. Decennial Census". United States Census Bureau. Archived from the original on April 22, 2013. Retrieved September 24, 2015. ^ Staff, Website Services & Coordination. "2010 Census Interactive Population Map (Text Version) - U.S. Census Bureau". www.census.gov. Wikimedia Commons has media related to Colusa County, California. This page was last edited on 4 March 2019, at 02:39 (UTC).